At 17:00 the US will be informed about the change in the level of vacancies and labor turnover from the Bureau of Labor Statistics for February. At 23:30 the American Petroleum Institute (API) will release weekly crude oil inventories. On the general weakness of the dollar buyers EUR / USD went resistance zone 1,1250-1,1254. At the moment, the euro is worth $ 1.1270. Buyers are trying to continue to grow, but as all crosses with the euro traded in negative territory (except EURCHF), the euro is still under pressure. On Wednesday, two important events are planned: a meeting will be held with the ECB press conference, Mario Draghi, and will be released minutes of the March meeting of the FOMC. If we add new headers by Brekzit, we get high volatility throughout the day. Today, the economic calendar is empty, so the forecast EUR / USD should consider re-test support, which yesterday stood resistance. 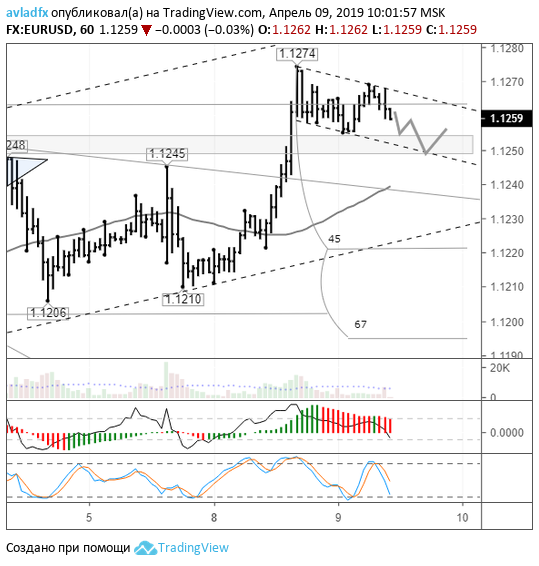 The EUR / USD approached the top of the support, so nothing keeps buyers to move it higher on the uplink to 1.1289.